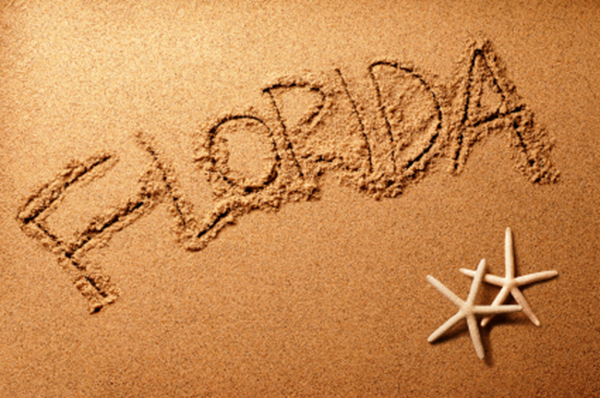 Florida: It’s affectionately known as “the sunshine state.” And for good reason! On average, Florida has 300 days of sunshine per year. That’s pretty amazing! And that’s just one of the reasons that Florida is home to a whopping 20 million people, which makes it the third most populous state in America. People from all over the world flock to Florida for the warm days and happy atmosphere. Keep reading to learn 10 more somewhat sunny and interesting facts about Florida. Love golfing? Then you’ll love Florida. With more than 1,300 golf courses, there’s never a shortage of this popular sport. Plus, Palm Beach County specifically has more golf courses than any other county in the entire country. As if that’s not enough to show Florida’s love of golf, you’ll find the World Golf Hall of Fame and Museum in St. Augustine, Florida. Florida is widely known for its hot weather, sunny days and very mild winters. This has made it a welcome haven for retirees from all over the country who want great weather year-round. That’s why so many people every day choose to pack their bags and relocate to sunny Florida. If you plan to dig for dinosaur bones, you won’t have any luck in Florida. That’s because, during the dinosaur age, the Florida peninsula was underwater; it was totally nonexistent as a land mass. Florida state law says that if you have a car in Florida for more than 90 days per year, that vehicle must be registered in Florida. And those 90 days do not have to be consecutive! Even out-of-state residents must insure their car in Florida and must prove that they meet the state’s minimum insurance requirements. Florida’s official state flag, adopted in 1900, has a red cross of St. Andrew on a white field. The center features the Florida state seal, which shows the sun, palm trees, a steamboat, land, water and a Native American woman scattering flowers. Not many hills here! Florida’s mean elevation is only 100 feet. The state’s highest natural point, Britton Hill, is only 345 feet above sea level. For comparison, Britton Hill is the lowest high point out of any state in America. In 1987, Florida legislature named the American alligator as the official state reptile. The alligator symbolizes the extensive untamed wilderness and swamp land found throughout Florida. •	Turn about: Turn your car around in a 30 to 40 foot space. •	Gear shift: You must be able to shift gears smoothly. •	Stop quickly: While driving at 20 MPH, you must make a quick, safe stop. •	Back up safely: You will have to back up for 50 feet while driving slowly. You also can’t use the rear-view mirror, but instead should turn your head to look back. •	Use stop signs correctly: Show that you can come to a complete stop correctly and then proceed into the intersection only when it is safe. •	Signal and turn: Demonstrate that you can use your turn signal 100 feet before you turn. •	Stay in the correct lane: Show that you can stay in the right lane and only change lanes when it is safe. In fact, Greater Miami is the only metropolitan area in America with two national parks: the pristine Everglades National Park and the picturesque Biscayne National Park. Orange lovers love Florida! Can you believe Florida makes 75% of the country’s oranges? In addition, Florida accounts for 40% of the world’s orange juice supply. Now that’s a lot of delicious orange juice!